Outer Space | Inner Space is an award winning collaboration between the School of Life Sciences‘ Centre for Gene Regulation and Expression and the School of Science and Engineering‘s Discipline of Computing with Leisure and Culture Dundee. It brings together an interdisciplinary group of scientists with one of Dundee’s iconic landmarks, the Mills Observatory – Britain’s first purpose-built public observatory, in order to develop an adaptable, accessible exploration space and activities under the theme of “Ways of Seeing” the invisible universe. Science Saturday at the Mills Observatory with The Centre for Gene Regulation & Expression (GRE) and AXS Studio‘s VR adventure Guardians of the Genome! The interactive exploration space is used to develop, trial and offer public engagement activity that is technology-based, and reaches the widest possible community within a public space. Fishy Tale told in Dundee (2016). The Courier Dundee. The Mills is 80 (2015), STV News Dundee. A voyage to outer space – and inner space (2015). CONTACT Magazine. Contact is the University of Dundee magazine. It is published 4 times per year and is distributed to staff at each University campus. Press Office, University of Dundee. New exhibit to mark 80 years at Dundee’s Mills Observatory (2015). BBC News Scotland Website. Winter Installation 2017/18 at the Mills Observatory. Winter Installation 2016/17 at the Mills Observatory. Come and explore the Giant Worm, see it in real under the microscope or use the interactive giant screen. 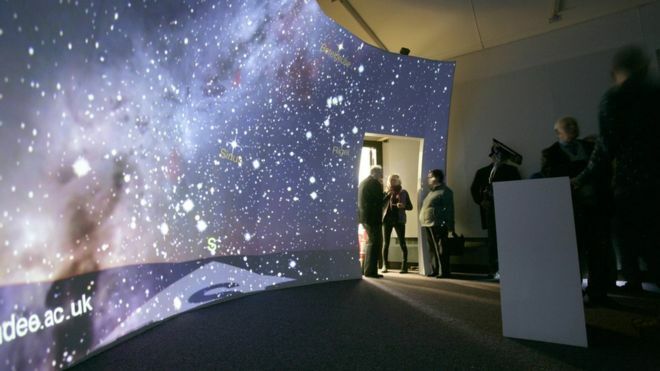 The Outer Space | Inner Space project, a collaboration between the University of Dundee and Leisure and Culture Dundee, has taken off to a new dimension. A local special school for children with multiple disabilities visited recently for a multi sensory trip to the stars! The new immersive screen was filled with images and videos about everything you need from space boots to meteorite clusters. Access via switch allowed for our young space pioneers to keep control and everyone arrived safe back on earth!